Every geographic LEADER area is represented by a Local Action Group (LAG). The LAG is made up of approximately 25 individuals who work together to fund projects that help improve their local economy. The Loddon and Test Local Action Group is not a formally constituted group, its members are volunteers and the group is a dynamic entity, continually adapting itself to local needs and aspirations. It operates under a Terms of Reference, but has no legal responsibility or liability. 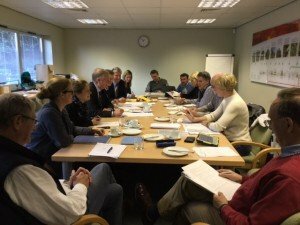 The legal liability rides with the Rural Payments Agency (an executive agency sponsored by DEFRA), and an Accountable Body (Hampshire County Council) represents the LAG and is responsible for the delivery of the programme on their behalf. The membership of the Loddon and Test LAG partnership is diverse and supports the objective that the LAG is a local community led programme. It embodies a broad cross section of representation throughout the Loddon and Test LEADER area; from public, private and civil society. The members work together, sharing their knowledge and best practice from the various sectors they represent, including; local businesses, farming, forestry, nature conservation, community, heritage and tourism. Over 40% of the LAG are from private industries and over 30% are represented by civil society organisations. The remaining members are from the public sector. There is no fixed length of term for members and they are encouraged to remain engaged for the lifetime of the programme. New members are also welcomed to join and if you feel you can contribute, please contact us using the links below.